1Start Internet Explorer and choose Tools→Internet Options. You see the Internet Options dialog box fade into view. Note the Turn On Pop-Up Blocker check box at the bottom of the tab. This is the control that turns pop-up blocking on and off; it’s turned on by default. The Pop-Up Blocker Settings dialog box appears. 4In the top portion of the dialog box, enter any sites for which you want to allow pop-ups. Believe it or not, you may want pop-ups to be permissible on some sites. For instance, if your bank uses pop-ups to prompt you for security information, you don’t want these pop-ups blocked. 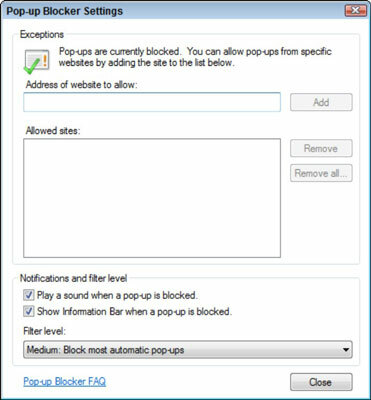 5Select how you want the pop-up blocker to work by using the controls at the bottom of the dialog box. Your settings are saved and implemented immediately. You can then close the Internet Options dialog box.